This typical bedroom closet has been organized for maximum storage in a small space. The storage drawers closet built ins are wide and deep to take the place of a dresser, eliminating the need for extra furniture in the bedroom. Despite the addition of shelves for folded clothes, drawers and built in hamper, total hanging space has been maitained by configuring the space to include a double hang section to the right and another hanging section for medium and long clothing within the deep return on the left side of the closet. If you want to become better organized personally, start with your bedroom closet. It is the last place where most of us will be before we go to bed bed and the one of the first places we go when we wake up each morning. If you hope to begin and end your day on an organized and efficient note, the bedroom closet must not be ignored. 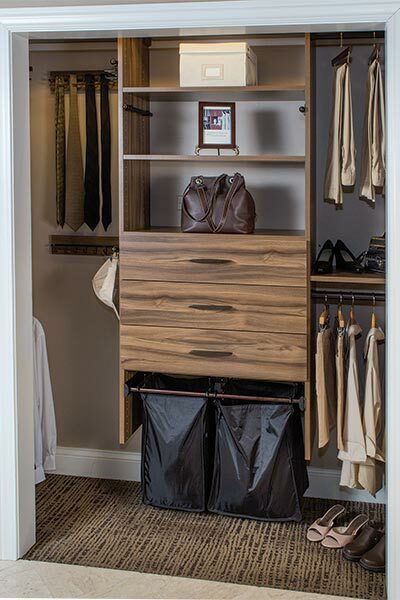 A custom closet designed specifically to your needs is a great way to start the organization process. This practical, reach-in closet design positions much of the hanging space in the left corner, behind the wall. This frees up the center for drawers and shelves. The warm brown tones of the storage drawers closet structural components are complimented by the oil-rubbed bronze finish on the hardware (almost black with a hint of red coming through). 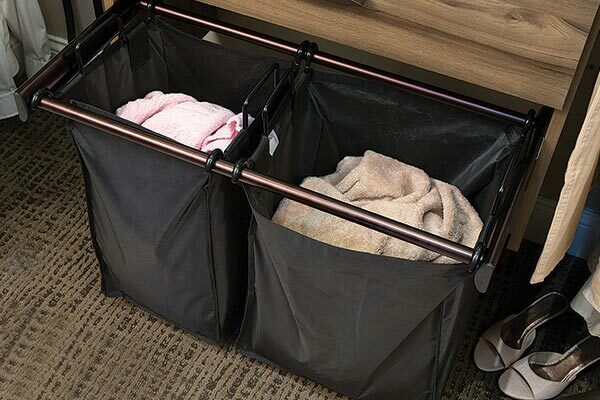 The pull-out Synergy basket is great for laundry. Two sections allow you to sort darks from lights, or dry cleaning from wash, right in your closet. The popular Synergy pull-out basket closet hampers are available in 24" and 30" widths. The 30" version includes one small and one large bag. The 24" is configured with two small bags. Both sizes are available in polished chrome, brushed chrome, and oil-rubbed bronze to match the rest of your closet accessories.